to look, feel and function better after having a baby, whether you had your baby 2 months or 20 years ago! It is the definitive, medically reviewed, endorsed Mummy Tummy Workout System, created by postpartum fitness expert Wendy Powell, for women who want a core + a pelvic floor that work, feel right + do their job. It’s for women who want to lose weight after childbirth and keep it off. The program you will experience, whether a one-on-one client or as part of a semi-private or group class, is holistic, not focusing on exercise alone. At the Pain Free Clinic of Denver our focus is healing through corrective exercise. The exercises we teach are designed to strengthen, heal and align your whole body. The body is a unit so if one part is weak or not functioning properly many other parts will feel or suffer the effects. Whether you are a new mom or a mom who gave birth 20 years ago, if you are experiencing the woes of pelvic floor weakness (incontinence, leakage when you run, jump or cough) or diastasis recti (abdominal split), then the MUTU®System training sessions we offer are designed specifically for you! We always begin with a postural evaluation in order to educate both you and me on where you are experiencing misalignment and/or muscular dysfunction. From there we will design a series of training and exercise sessions to help restore alignment, strength, function and overall body confidence. As a postural alignment specialist I will use all of the tools I have learned through my training as a MUTU Pro™, a certified Foundation Training Instructor, and my training through Egoscue University to help you realign and safely strengthen and heal your body. So whether you suffer from pelvic floor weakness, diastasis recti or chronic neck, back or foot pain (think plantar fasciitis) I can help you by teaching you corrective exercises that allow YOU TO TAKE CONTROL OF YOUR BODY AND HEAL YOURSELF. Stasia was privileged to be a part of the first ever MUTU System Pro™ training and certification! So many people have asked Wendy for local help for years and here we are! We are convinced that there is no better program than MuTu to help moms heal, restore function, and feel more confident as they get strong! Alignment! The Pain Free Clinic of Denver is all about alignment using principals from the Egoscue Method, Foundation Training and MUTU System makes our clinic the place to come for alignment and functional movement in Denver, Colorado! Move: learn to move functionally and intentionally through corrective exercise. Come in to Pain Free Clinic of Denver and learn which exercises will help you and which may be hurting you. We will also teach breathing patterns that will be of great value to you! Doing any exercises that causes outward or downward pressure on your abdomen will only make things worse. The exercises Wendy has used to create MUTU System are safe, effective and proven to create positive results! Breathing plays a huge role in making positive change in both the core and pelvic floor. Join MUTU System and one of my classes to learn the importance of breathing in relation to the core and pelvic floor! "Over 2 years later and I am fitter and stronger than I was before babies! My DR has closed to a normal width and my core is strong, stable and functional. My alignment is so much better, and as a lifestyle change, will only continue to improve with practice. The best part is, I did all of this while having not one but TWO babies at home. I found a way to get proven results while not spending hours at the gym. That's right mamas, there is hope! You can be fit and strong and have a fabulous core even with a baby (or two) at home. I can't wait to show you how! It will be fun and empowering and strengthening and relaxing all at the same time!" "Seeing Stasia at Pain Free Clinic of Denver helped me tremendously with my pregnancy and delivery! I started seeing her 4 months into my pregnancy because I wanted to stay healthy throughout my pregnancy and do something that was safe for my baby. She started me on this workout program called MuTu System. I enjoyed this program a lot! Three benefits of it was getting to be trained by a very trustworthy, caring, and faithful coach. Two do a workout that was safe for my baby and me. And three make my delivery so much easier by having a core that was that much more prepared to deliver the miracle God has given me. When I went to deliver my son I felt my core was prepared and ready to help the process of the delivery. even the nurses commented on the strength of my core and pelvic floor. I say all of this to thank you Stasia for "laboring" (; with me through this sweet journey given by God alone. Thank you for everything. I HIGHLY recommend Stasia with Pain Free Clinic of Denver!" "Loved working with Pain Free Clinic of Denver to complete the MuTu Core & Pelvic Floor class. I definitely felt so much stronger after the 12 weeks and have noticed an improvement in my diastasis recti as well." "I told my husband this morning that the MuTu class at Goodson Rec Center was the best and most effective class I've ever taken!" 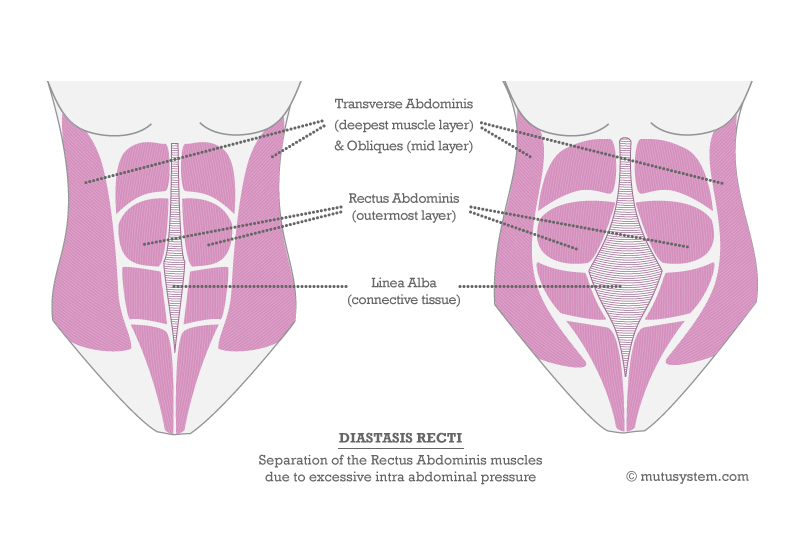 As noted at MUTU System; Diastasis Recti, also referred to as ‘Divarication of the Recti’ or ‘Rectus Divarification’, is the widening of the gap between the 2 sections of the Rectus Abdominis (or 6 pack) abdominal muscle. The split occurs at the Abdominal Raphe (Linea Alba and Linea Semiluniaris), the seam of mid-line collagen structures of connective tissue at the front of the abdomen. This connective tissue stretches (weakening in the process) to form a diastasis. The Abdominal Raphe can now no longer provide tension and stability. All the abdominal muscles meet at the front of your abdomen – so when the linea alba stretches and leaves a gap – it takes all your ab muscles with it. And because ALL the muscles of the abdomen- Transversalis, internal and external obliques, as well as Rectus Abdominis – meet at this center mid-line, all are compromised, and the resultant lack of protection and stability affects the whole body both aesthetically and functionally. It is common in the later stages of pregnancy, particularly second or subsequent pregnancies. But men, children and women who have never had a baby, get a diastasis too. Pregnancy, posture and alignment, chronic stress, wrong exercises and even poor breathing patterns are often underlying causes or contributors to pelvic floor weakness, pain and dysfunction. Katy Bowman says, "Most pelvic floor issues are created not by one-time events like pregnancy or a skiing accident (like falling on a hip), but by habits that accumulate over time — especially those habits we all share — sitting in chairs the bulk of every day, not using a squat throughout a lifetime, exposure to chronic stress, and then, of course, doing extreme correctives and overdeveloping tension in the abdomen and pelvic floor. " For many people corrective exercises & correct breathing can help bring strength and healing to the pelvic floor as well as to the gap caused by Diastasis Recti. Equally important is knowing that you want to focus on exercises that don't cause outward or downward pressure is important. This means that exercises like crunches, Yoga Boat Pose are not great...at least not until you tighten the gap and/or strengthen the pelvic floor.